Michael has been a comic book fan since 1974, and while my interest in comics is not as long or as deep as his, I have always enjoyed superhero stories. So when we found out that Boston Comic Con was being held on a weekend we were available, we started to make plans to attend. One of the celebrity guests was John Barrowman, of whom we have been fans for many years, and there were going to be photo opportunities available with him. Also, there were going to be a number of comic book creators in attendance that Michael wanted to meet. We wanted to take the girls with us rather than finding other things for them to do that day. They have been aware of comics-related characters and stories almost since they became aware of the world around them. When Muffin and Squeaker were infants, Michael used to lift them over his head and hum the music from the 1978 Christopher Reeve “Superman” movie, “flying” them as Super Muffin and Super Squeaker. (He even made up words to sing to the theme.) Over the years, we introduced them as well to Spider-Man and Batman. And recently, Squeaker has become interested in The Hulk. We have shown them cartoons starring superheroes and have shared age-appropriate comic book stories with them. 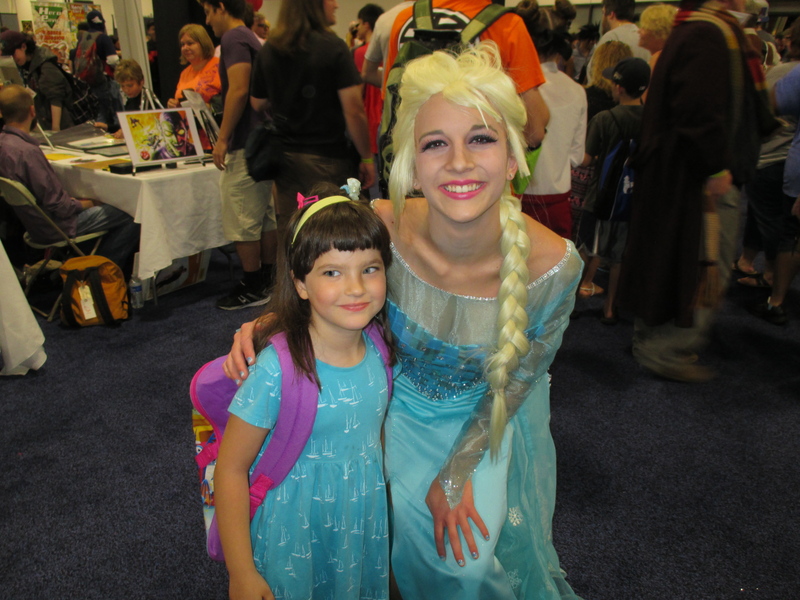 So when we told them we wanted to take them to a comic book convention where people would be dressed in costumes like some of their favorite characters, they were interested and somewhat intrigued. Michael had taken them to Boston Comic Con in 2012, but they didn’t remember much of it. It also turned out that the celebrity photo opportunities could be turned into family events and were not restricted to one person only. And Barrowman has a reputation for being wonderful with kids, so Michael and I decided that we’d do the photo with all of us, provided the girls were in the right mood for it. During the week leading up to the convention, we talked to them about where we were going to go on Sunday and what we were going to do. I located my action figure of the character from “Torchwood” that Barrowman played, Captain Jack Harkness, within the girls’ toys and told them that we were going to be meeting the man who plays Captain Jack. Muffin immediately decided that I had to bring the action figure on Sunday so that I could show it to him. 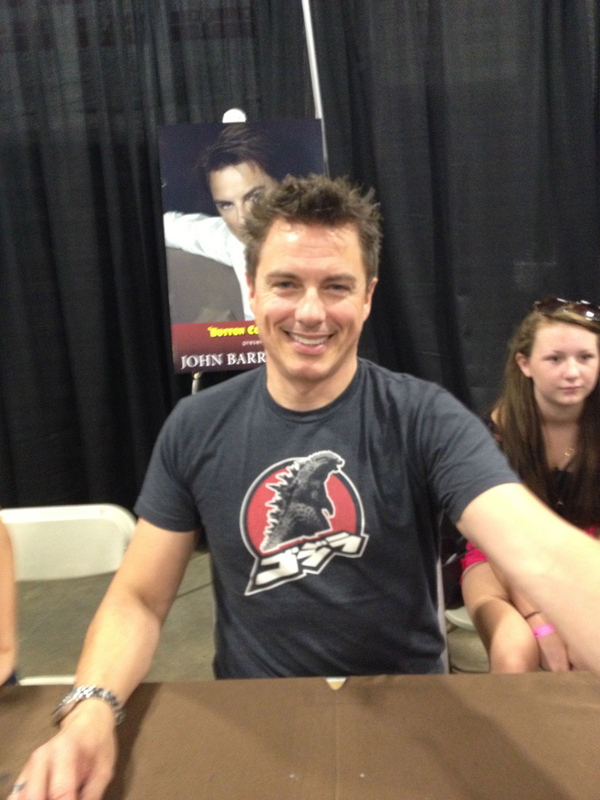 (In the end, she herself ended up being the one who showed it, and Barrowman seemed amused.) And on Sunday morning, after packing up what we’d need for the day, we were off. We arrived at the convention center at around 10:45 AM, and almost immediately upon passing through the entrance I noticed a man in full Spider-Man costume. I pointed him out to Squeaker, and he must have overheard me, because he turned and waved at us. 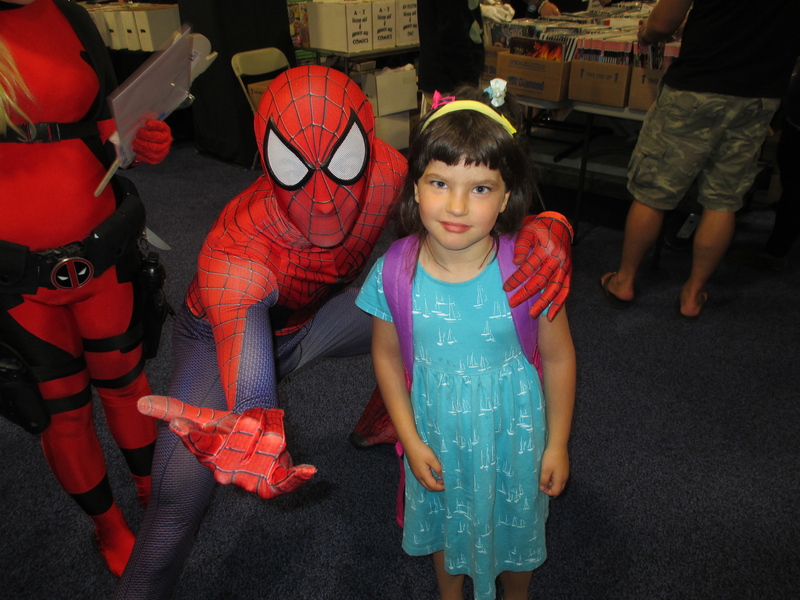 She wanted to get a photo with Spidey, and the man in the costume was very accommodating. He was also willing to take a photo with Muffin, but she was feeling too shy. This, in fact, started a trend for the day — Squeaker would find people in costumes of characters she recognized and would ask Michael to ask if she could have a photo taken with them, and Muffin would turn down similar opportunities. When we got to the area where the artists and writers were, we found that there was a medium-length line to meet the creators that Michael really wanted to meet. We got into the line, and the girls very quickly got restless, since waiting in line is not at all their favorite activity. To ease their boredom, we let them play some games on our phones while we waited. 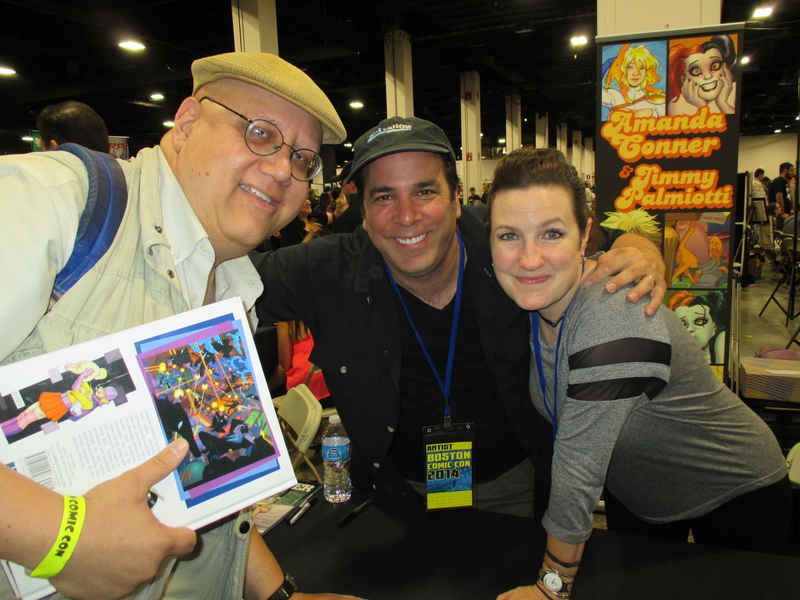 They were very good at giving us back our phones when we got to the head of the line and it was our turn to meet the creators, Amanda Conner and Jimmy Palmiotti. 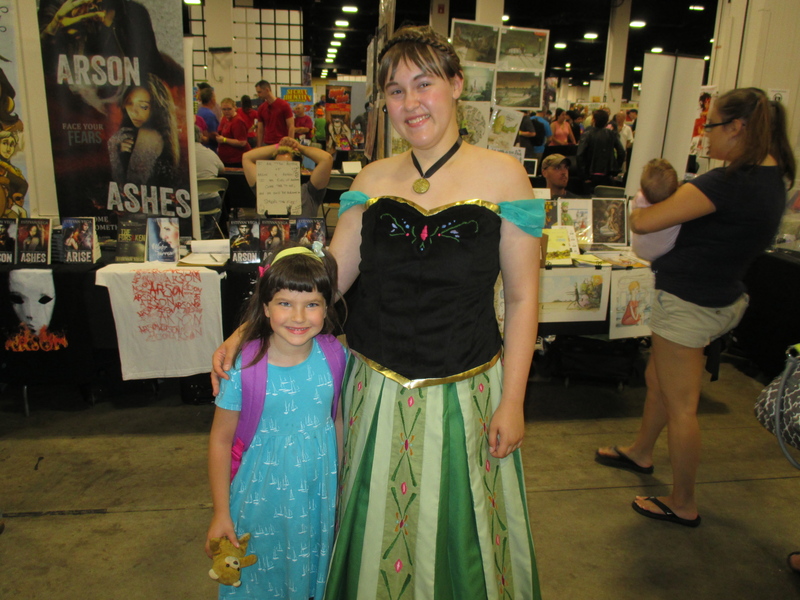 The girls have become big fans of My Little Pony, and there was at least one artist, Sara Richard, at the convention who drew My Little Pony art, so while I was sent to go get Barrowman’s signature in my copies of his books, the girls and Michael went to meet her. After we met back up and took some time to eat lunch, it was almost time for our photo op with John Barrowman. Again there was a long line that we and the girls had to wait in, and again we gave them our phones to amuse themselves with. And again they were good at giving us our phones back as needed, both to respond to messages we received from people we were trying to meet up with and when it was our time for the photo. When we got to the top of the photo line, and Barrowman saw us and the girls, he immediately crouched down to the girls’ level and said hello to them. Muffin showed him the action figure, and he said, “That’s me!” The girls seemed a bit uneasy about this man they didn’t know, but they posed nicely for the photos and then we went back out to the convention floor. 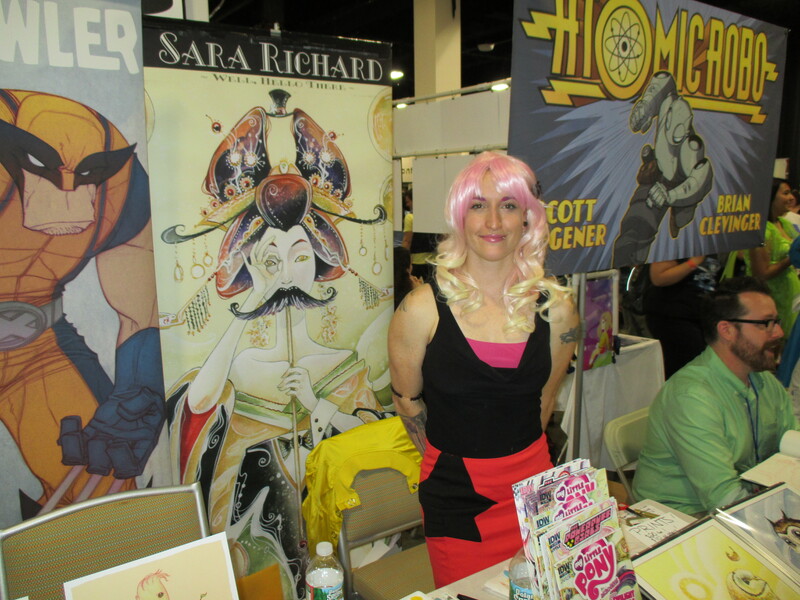 We spent a bit more time wandering through the artists’ area and met a couple more creators, Mark Waid and Dan Parent. By then it was approaching 4:15 PM and we were all getting tired. We picked up our printed photos and then headed out, stopping briefly to look one last time at some of the items displayed for sale. We arrived home tired but satisfied. 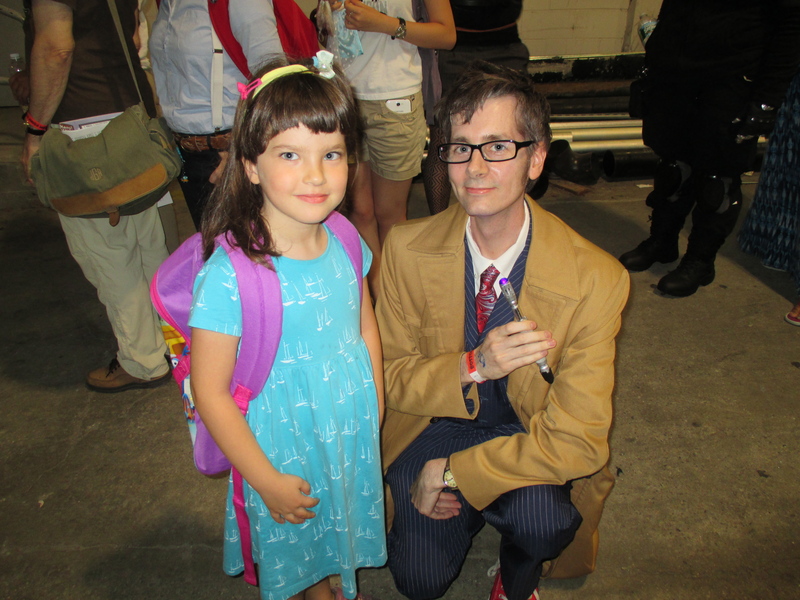 Our adventure in the Comic Con world had been a success, and all of us had stories to tell. If the scheduling works, perhaps we’ll attend again next year. This entry was posted in Columns and tagged comics, conventions, Disney movies, Doctor Who, Frozen, Superheroes, torchwood. Bookmark the permalink.